Ayodha is first among the seven Mukhti Kshetras. As per sthalapurana, Sriman narayana took out Ayodhya , an important of Srivaikunta and presented it to Swayambhu Manu, the eldest son of Brahma. Manu Chakravarthi brought this to Booloka and placed it on the southern bank of the river Sarayu. The original Ayodhya temple on which the Azhwars composed Divya Prabanda are not there today due to foreign invaders. There is an ammaji temple on the banks of the Sarayu river and a temple of Sri Ranganatha with a Sannidhi for Rama. Even the legendary palaces of Emperor Dasaratha, his queen Kousalya and other buildings could be seen. A southern style Ammaji Mandir could also be worshipped. The Saraswathy is not visible to our eyes. Even the ashram of the sage Bharadwaja exists. There are many Mutts and Dharmasalas. Beautiful dharmasalas and choultries to stay. Reachable from Varanasi. The most revered Gaya Srartham is done here. The famous Vishnupaada Puja done at 8 p.m. every day is very beautiful. River Phalguni flows here. Reachable from Gaya via Calcutta. Though it is called Puree in legends, currently is called as Poori. There are many Punya Theerthas. Theertham - Paramapadasathya Pushkarini, sarayu river. The Moolavar of Ayodhya is Sri Ramar. He is also called with the names "Chakravarthy Thirumagan", facing his thirumugham towards North direction. 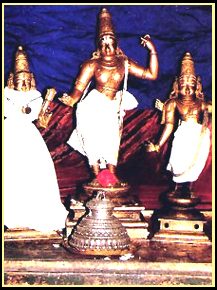 Prathyaksham for Bharadhan, all Devars and Maharishis. Thiru Ayodhya is said to be the Janmha Bhoomi (Birth place) of Sri Ramar and is situated 6 Kms from Faizabad. Ayodhya is well connected with other places by road, as it is located on the main highway. Transportation by means of Tempos, Cycle-rickshaws and Buses are available and frequent.